Over the course of the last three and a half years, the library’s appearance and functionality have steadily been revised to provide among other things, a clearer sense of place. One recent change in this vein was the addition of a hand-painted sign above the circulation desk. The new sign gives a robust welcome to students and other patrons of the library. It was painted by a young artist and hand sign-painter named Jon Bocksel. Jon learned the arcane trade of hand sign-painting over several years as an apprentice to experts in hand-lettering from the time preceding digitally-produced signs. In planning for a commission, he absorbs a large amount of visual information before embarking on the design process. For the Seton Hall sign, he spent a morning on campus conferring with University Archivist Alan Delozier and took back many images to his studio. Alan had gathered yearbooks, insignia, and the Seton family’s as well as the University’s crest as a corpus of visual context for Jon on Seton Hall. Alan also showed Jon two fascinating and little-known murals of SHU sports teams, located in the University Sports Center and painted in the 1940’s by a recognized fresco painter of Italian cathedrals, and immigrant to New Jersey, Gonippo Raggi (https://en.wikipedia.or/wiki/Gonippo_Raggi). Jon’s final sign references the history of SHU publications as well as sports uniforms which, according to him, are often rich carriers of institutional self-expression in the form of typeface choices. All in all, his sign sets off the entrance space to the library in an emphatic way that provides directness and warmth. 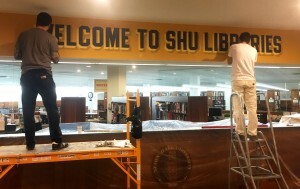 Welcome to SHU Libraries! Previous Previous post: Graduate Student Lounge Returns!